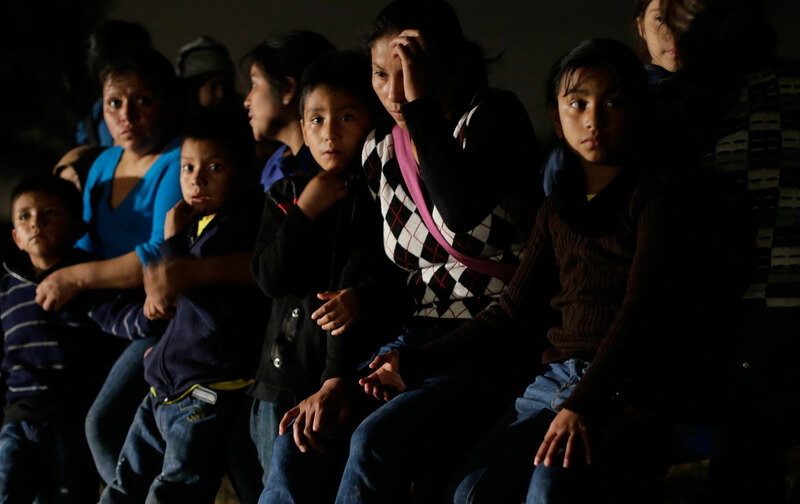 The renewed arrivals revive a heated political debate about just how much the US ought to accommodate children and families who are escaping deadly conditions in Central America. Before the current debate over Syrian refugees, and before this summer’s European migrant crisis, the United States confronted a humanitarian emergency of its own last year. More than 68,000 children from Central America made it to the US after fleeing rampant gang violence in their home countries. After a brief lull, families and unaccompanied children from El Salvador, Guatemala, and Honduras are again crossing into country in large numbers in recent months. The renewed arrivals revive a heated political debate about just how much this country ought to accommodate children and families who are escaping deadly conditions in Honduras, El Salvador, and Guatemala—which rank first, fourth, and fifth in the world, respectively, in homicide rates. Between the start of October and the end of November of this year, 10,588 children traveling without a parent or guardian were apprehended by Customs and Border Patrol at the southwest border, more than double the 5,129 who were apprehended during the same two months of 2014. And that’s not all. More than 12,500 children and their guardians were taken into US custody during the same time frame, a 173 percent increase over the 4,577 family units who were apprehended at the US-Mexico border in October and November 2014. “There was never the downshift you usually expect with migration patterns and weather,” Mohammad Abdollahi, advocacy director at the Texas-based Refugee and Immigrant Center for Education and Legal Services (RAICES), told The Nation. “The trend we’ve noticed is increased violence [in Central America] means an increase in people fleeing and coming here,” Abdollahi said, pointing to the uptick in violence which followed Guatemalan President Otto Perez Molina’s September resignation as a factor fueling more migration. The resurgence of child migrant arrivals comes amidst a presidential election season that’s been dominated by wild talk about immigrants, refugees, and Muslims (regardless of their nationality). But long before campaign season even began, Central American asylum-seeking children drew a vitriolic response. Last summer cable news stations played footage of children and women crossing through the US-Mexico borderlands on a steady loop. Demonstrators in the Southern California city of Murrieta formed a multi-day blockade to keep out children who were headed for a detention center in town. Just five words of Clinton’s statement stuck: “They should be sent back.” Martin O’Malley, who has struck an explicitly pro-immigrant tone in his presidential campaign, has returned to Clinton’s choice of words repeatedly to draw contrast between himself and the former secretary of state, who he’s accused of too easily compromising her principles in favor of more savvy political triangulation. The same voices who warned against allowing Central American child asylum seekers to stay in the country last year are the same voices who now “advocate for the U.S. to turn our backs” on Syrian refugees, Sanders wrote in his immigration platform. Children in particular deserve legal representation as they navigate the immigration system, Sanders has said. Since 2013, large waves of children, propelled by the hope of survival at the barest minimum, have traveled north to the United States. Many had relatives already in the US and wished to reunite with parents and wait for longer-term humanitarian protection. When the numbers of unaccompanied minor children entering the country dropped off to pre-2013 levels as summer waned last year, Department of Homeland Security Secretary Jeh Johnson attributed the dip to several new initiatives, including expedited processing and deportations for adults with kids and PR campaigns the United States mounted in Central America to discourage migrants from making the treacherous journey through Central America and Mexico. Under US pressure, Mexico also stepped up its own immigration enforcement, increasing deportations and patrols of common migrant routes, including the deadly freight train popularly known as La Bestia (the Beast). The song “La Bestia,” a hit in Central America last summer, opens with Eddie Ganz crooning the lines: “Migrantes de todas partes / Se atrincheran en los durmientes, / Muy lejos de donde vienen / Más lejos de adonde van.” (“Migrants from everywhere / Entrenched among the rail ties, / Far away from where they come, Farther away from where they go.”) It was commissioned by the US government. Last December the United States also began accepting applications for a brand-new program ostensibly designed to provide Central American children hoping for humanitarian relief an opportunity to process their cases without having to leave their home countries. In order for a child to be granted entry into the United States, a parent or guardian in the country with legal status must apply on behalf of their child, and both guardian and child must clear interviews and DNA tests. Eleven months after the start of the initiative, the United States had received 5,400 applications, completed 90 interviews, and brought zero children into the country. Following a searing New York Times report on the program, the government announced that the first beneficiaries of the program would join their families in Baltimore and Los Angeles. Experts warned then that intensified enforcement alone wouldn’t shift the conditions propelling children to leave their home countries. Many of the dynamics which drove people’s desperation last year—forced conscription into gangs, kidnappings, rampant violence, and crippling poverty—are an unchanged reality today. “The worst is over for now,” Johnson said in a statement last September. In the light of this current December, that abatement appears to have been temporary. The Department of Health and Human Services’ Office of Refugee Resettlement has ramped up its housing plans to provide shelter for the new uptick.